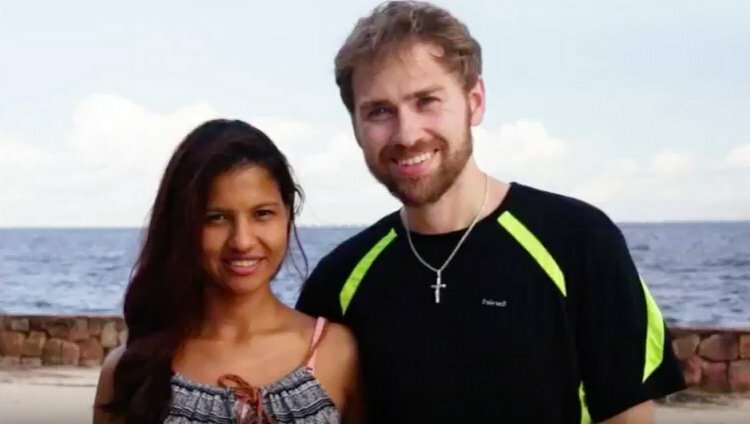 One of my favorite 90 Day Fiance: Before the 90 Days couples has been Paul Staehle and Karine Staehle. Although their romance was turbulent and drama filled, there was something about the couple that made me root for them. Maybe it was just nice to see that two odd ducks were able to find each other in a world filled with less odd ducks. Fighting and making up via Google Translate, of course! Paul and Karine faced many challenges to their relationship and eventual marriage. Paul’s criminal record. Financial problems. Immigration issues. Language barriers. And a heartbreaking miscarriage televised last season. Now, the couple has shared some good news-they have announced the birth of their first child. In an US Weekly exclusive, Paul and Karine announced that their son, Pierre Martins Staehle arrived on Friday, March 22, weighing 6.9 pounds and measuring 19.7 inches. Paul said, “I’m very happy, very excited. I’m also very nervous and want to do everything the best that I can and do everything right.” I have to admit, I really like the name-Pierre Martins sounds kind of regal and the names flow well together. Knowing Paul as we do, I imagine he and Karine showed up at the hospital very prepared-with mosquito netting, flares, a hazmat suit, three military trunks and two car seats. Paul is the kind of guy ready for anything! Karine also shared, “I am fine, and happy, even with the hard time I have had. And I am recovering well, but I am still very weak. It was super hard, but now everything is fine because the baby is calm and he is breastfeeding well.” Which is really all new parents can ask for-a healthy, happy baby. One concern for the new father is the baby’s name-or more specifically, his initials. Paul told US Weekly, “The initials, I don’t like. The initials she wants are ‘PMS.’ She doesn’t get why it’s bad. It’s not gonna be good. I was bullied all my life. It’s not good initials.” Paul, I kind of see your point. But as Martins is Karine’s maiden name, it is easy to understand why she chose the name. RELATED: 3 More Couples Announced For New Season Of 90 Day Fiance: Happily Ever After? The Staehle’s join a recent 90 Day Fiance baby boom-Russ Mayfield and Paola Mayfield welcomed son Axel on New Year’s Day. And Elizabeth Potthast and Andrei Castravet announced the birth of daughter Eleanor Louise, also in January. Both couples will be appearing on the upcoming season of 90 Day Fiance: Happily Ever After? Congratulations to Paul and Karine on their new addition! TELL US-DO YOU LIKE THE NAME OF PAUL AND KARINE’S BABY? DO YOU AGREE THAT THE INTITIALS MIGHT BE PROBLEMATIC?